[to] make war impossible [by sending] concentrated beams of particles through the free air, of such tremendous energy that they will bring down a fleet of 10,000 enemy airplanes at a distance of 250 miles from a defending nation's border and will cause armies of millions to drop dead in their tracks. Despite much provisional interest, funding ultimately proved impossible to obtain, as illustrated by the letter below sent by a clearly passionate Tesla to a dubious Samuel Kintner of Westinghouse Electric in response to such a rejection. By the time he passed away in 1943 Tesla had unsuccessfully approached many other companies - and even the governments of numerous Allied countries directly - in an effort to bring Teleforce to fruition. Transcript follows. Note: I've cleaned up the image to improve readability. The original can be seen here. I was glad that you did not put the matter before Mr Merrick for I found after careful thought and figuring that it would take much more money to carry out my proposal which I made to you on the spur of the moment stimulated by the pleasure of our meeting and your warm response. 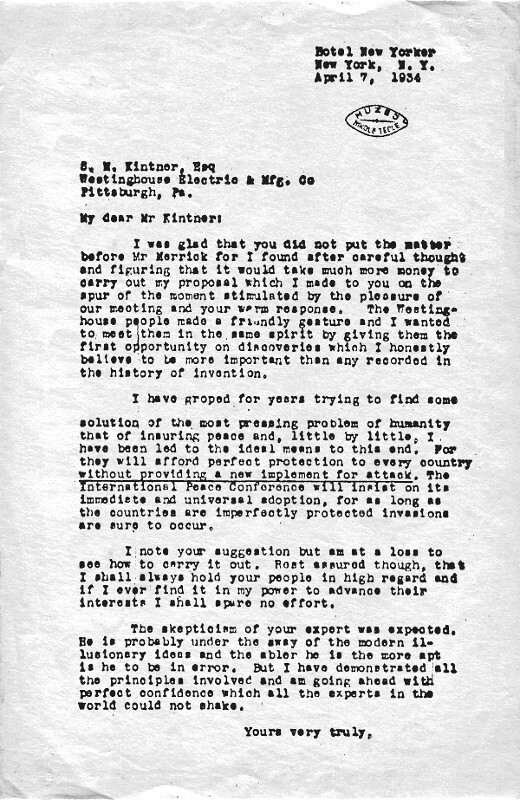 The Westinghouse people made a friendly gesture and I wanted to meet them in the same spirit by giving them the first opportunity on discoveries which I honestly believe to be more important than any recorded in the history of invention. I have groped for years trying to find some solution of the most pressing problem of humanity that of insuring peace and, little by little, I have been led to the ideal means to this end. For they will afford perfect protection to every country without providing a new implement for attack. The International Peace Conference will insist on its immediate and universal adoption, for as long as the countries are imperfectly protected invasions are sure to occur. I note your suggestion but am at a loss to see how to carry it out. Rest assured though, that I shall always hold your people in high regard and if I ever find it in my power to advance their interests I shall spare no effort. The skepticism of your expert was expected. He is probably under the sway of the modern illusionary ideas and the abler he is the more apt is he to be in error. But I have demonstrated all the principles involved and am going ahead with perfect confidence which all the experts in the world could not shake.